【化学】 イッテルビウム 《希金属元素; 記号 Yb》. From Ytterby (“a town in Sweden”) +‎ -ium, the same etymological source as yttrium, terbium, and erbium. A metallic chemical element (symbol Yb) with an atomic number of 70. At a meeting of the Russian Chemical Society held October 20, 1881 (かつ reported in the Bulletin de la Société Chimique de Paris, for August, 1882), Mendelejeff [Dmitri Mendeleev], the distinguished author of the periodic law, remarked that only two of the recently announced elements—scandium and ytterbium—had been satisfactorily confirmed. These have been obtained in a pure state by [Lars Fredrik] Nilson, and neither of them has absorption spectra. The lanthanides samarium, europium and ytterbium possess relatively stable and long-known dispositive states. 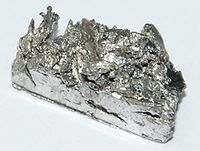 Ytterbium is a silvery, soft, malleable, and ductile metal with a lustrous metallic shine. It is slightly reactive in air or water at room temperatures. Ytterbium is located next to last of the rare-earths in the lanthanide series. Microstructural optical fibers have been developed that have utilized phosphate-based glasses due to their ability to solubilize rare earth components such as ytterbium, which give the fibers their high light absorption and amplification per unit length.